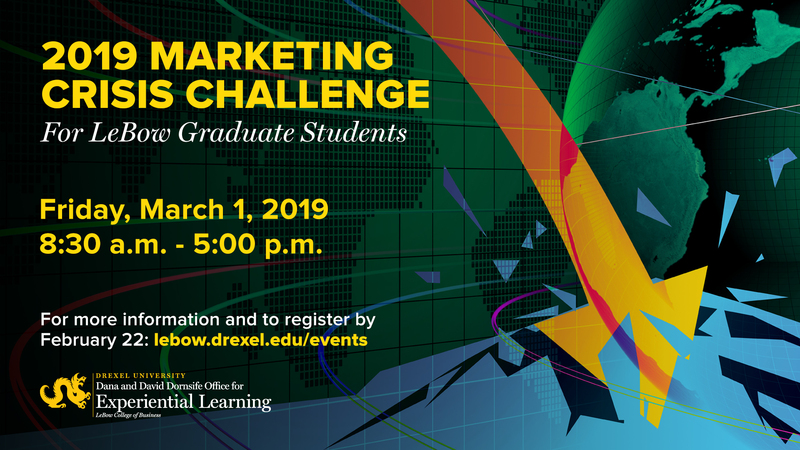 Friday, March 1, 8:30 a.m. – 5 p.m.
Drexel LeBow is proud to present the 2019 Marketing Crisis Challenge for graduate students. What is the Marketing Crisis Challenge? Drexel LeBow’s Marketing Crisis Challenge is a one-day competition that brings together teams of graduate students to come up with insightful marketing plans in response to a real-world controversial crisis. In preparation for the challenge, graduate students will form teams of 5-7 individuals. Groups will be tasked with crafting a response to a marketing related crisis facing a company. During the event, students will research the industry and apply what they’ve learned from their program coursework to create and present a recommended crisis management plan. At the conclusion of the event, teams present their recommendations to a panel of industry and faculty judges. Students will use their own laptops for research and to create their presentations. Dr. Daniel Korschun, Stephen Cozen Research Scholar in Marketing and Associate Professor will oversee the challenge. To be eligible to participate, team members must be currently-enrolled in a Drexel LeBow graduate program. To participate in the Marketing Crisis Challenge, all students must register by February 22, 2019 on the Drexel LeBow events calendar at lebow.drexel.edu/events.